In 1973, Geoff was studying Optometry at New Zealand's Auckland University. He joined the Sports Aviation Club, which was affiliated with Waitemata Aero Club, based at Ardmore Airfield. There he started flying 4-seat Piper Cherokees, but aircraft safety concerns soon saw him joining Auckland Aero Club which was, at that time, one of only two Governmentt-recognised flying schools in the country (the other being the Air Force). The AAC fleet consisted of AT3 Victa AirTourers: nippy wee 2-seat aerobatics-capable aircraft which were made in Hamilton and used as Trainers by the NZ, Australian and Israeli Air Forces. This resulted in his becoming accustomed to aerobatics well-before even gaining a full License! Full-time University, five part-time, shift-working jobs, plus flight-training soon took it's toll. Something had to go... And that was University. So he "dropped out" after two years of study and became a Computer Operator. Ironically, his second such job was back at the University's new Computer Center (tailor-made to house a "brain the size of a planet" Burroughs B6700 Mainframe), and it was whilst working there, in 1975, that he earned his NZ Private Pilots License. Time passed and Geoff moved to NZ's Capital (to work for NCR on their Century/Criterion computers), where he joined the Wellington Aero Club and was delighted to discover that he was the only member rated to fly their CT4 (the "grown-up" version of the AT3) Air Force Trainer along with their Grumman Tigers. Then Geoff made the big leap across the pond to follow his fortune with a number of Burroughs & Honeywell Mainframe sites in Sydney... and Flying sadly fell by the wayside. Geoff moved back to New Zealand, met his wife-to-be and they eventually move to the States, at which time he became associated with NZ's Airmaster Propellers. 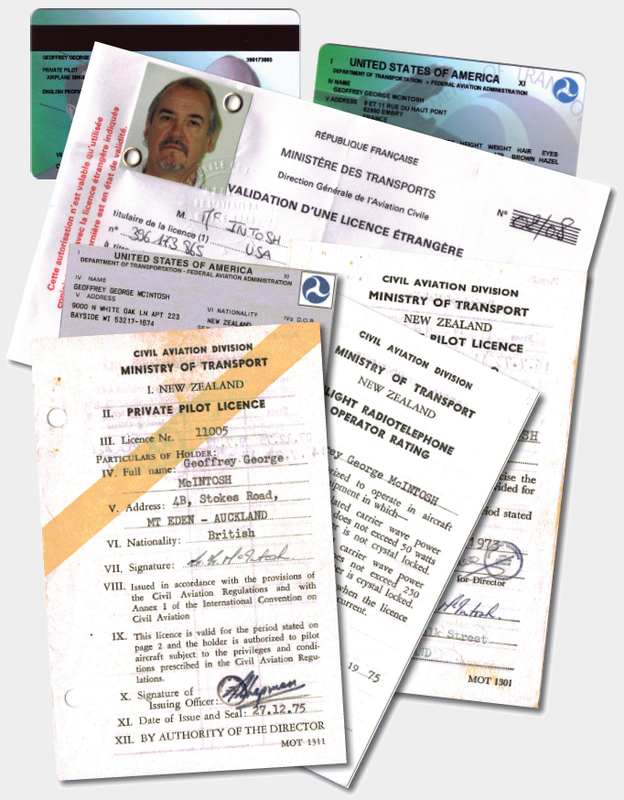 It seemed appropriate that he renewed his license, but America was just converting to a computerised system of handling Pilot's Licenses, and that system didn't recognise Victa AirTourers and without the verifying documentation (buried deep in a NZ storage facility by this stage), he couldn't simply do a Refresher Course. The easiest thing was "simply" to start again, from scratch! Which is what he did, this time in a range of Cessnas, right up to RG's (Retractable Gear and Constant Speed Props) and HP's (High Performance), flying out of Gran-Aire at Milwaukee's Timmerman Field, once home to the EAA, of which Geoff has been a member for 16+ years now. Geoff moved to England a few years later. He joined the Thanet Flying Club (TG Aviation) at London Airport (Manston), near Ramsgate, an old RAF Base (previously RAF Manston... Runway length 9,016ft !) and the closest UK airfield to France. Here he flew their Cessna and Piper Warrior range and made a few aerial forays across the English Channel (of Battle of Britain fame) to Belgium and France. A mere year later (2004) he found himself living in France, so he joined the "Aero Club de Berck sur Mer et Côte d'Opale﻿" (which was quite a mouthful over the radio, and is now simply the "Aero Club de Berck") which owned French-built Robin HR-200/100 and Cherokee PA28s. But whilst it had been OK for Geoff to fly G-registered (British) aircraft in France, it was NOT legal for him to fly F-registered﻿ (French) aircraft in the same airspace, even if identical ! ("Bureaucracy﻿﻿﻿" is derived from the French!!) So he then had to undertake renewed Training to become F-qualified... a process which still has to be repeated every two years, following each U.S. Medical ! Since then the aero club has aquired a French Issoire APM-20 Lionceau (Lion Cub) and Geoff has also had the chance to fly many other aircraft types, including gliders, Europas﻿, Tecnams, Ultralights, Microlights and the gorgeous fully-aerobatic Mudry CAP-10, another French creation.